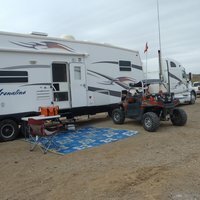 We have 3 acres of dirt to park on (all fenced) with plenty of room for any size rig. There is water and dump available upon request. pets must be nice and not aggressive. We have lots of animals on site. We have lots of room for everything. Alabama Hills, Fossil Falls, Burro Schmidt tunnel, Jawbone Canyon, Trona Pinnacles, Indian Wells Brewery and tons of off roading. thmterry provided a huge level space to park in and a very warm welcome. In the evening we chatted around a fire and in the morning he provided the tool for a small task (actually he DID the task) and water. The ladies got on exceptionally well and it was late before we hit the road. Thank you for the jelly and the eggs and an all-round great stay. Short one night stopover. Friendly and accommodating hosts. Hosts met us at their gates and directed us to a nice level spot. Lots of room. Safe, quiet and gated yard. Lots of very friendly pets. Appreciated the prompt response to our request to stay. Always nice when planning a trip. Thank you T&V. Thanks Vicky, Terry and Chris, hope till an other year or in Amsterdam ! 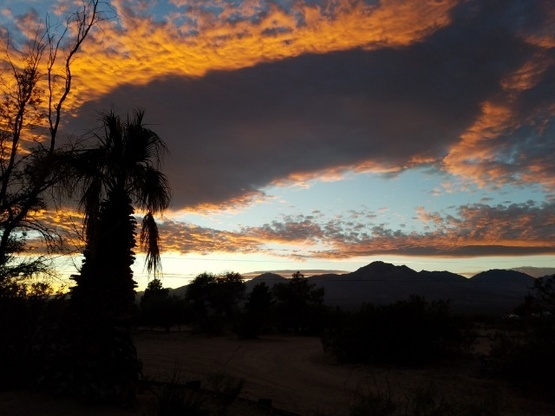 We arrived at Vickie and Terry's Friday, expecting to head into Death Valley on Saturday. My son got sick early that morning and we ended up not going, thinking maybe we could try again on Sunday. Vickie came out to make sure we were okay and had what we needed. We decided against Sunday too since he was still sick Saturday evening. Terry told us not to worry, and we could stay a bit longer if needed. That was a huge blessing since I ended up in town at the laundromat on Sunday to wash all the beddings and then in bed myself ALL DAY on Monday super sick. We were finally able to leave on Tuesday. We also had water pump issues while we were there that we were mostly able to sort out. Terry even stepped out to help us with that!! I don't know what we would have done without them. They were such amazing and gracious hosts and really went out of their way to make us feel welcomed and cared for. We really enjoyed our stay (under the circumstances) and look forward to returning to do all the things and more we had planned. We loved our location, the view, their pets, and their company. Thank you, Terry & Vickie!!!!! WoW what a lovely hosts ! We stayed at their great property for 2 nights (1 more than planed), and met their family who visit them for Christmas diner. As Dutchmen we learned to make Christmas cookies and loved their diner. We had a great time and hope to come back next year when we visit USA again. Great hosts. Super knowledgeable about the area. Although we know there's lots of free BLM camping in the area, we contacted thmterry for a one-night stay just so we could meet them. We're so glad we did. We had great conversations; they even threw in a campfire! They gave us helpful suggestions for the web site and also for places to visit in the area. For instance Indian Wells Spring Brewery (where we purchased a delicious selection to enjoy at our next few stops).